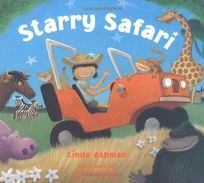 Energetic rhymes and action-packed spreads from the team behind Rub-a-Dub Sub chronicle a child's wild safari adventure. Foot to a jeep's peddle and hand on the horn, the child journeys at a manic pace through fields, river, mud and trees, encountering one jungle animal after another-zebra, wildebeest, giraffe-until: ""Floor the jeep,/ and go go go!/ Screeeeeech!/ A roadblock! Buffalo!"" Each picture links to the next: the buffalo watches the narrator take a cannonball leap into the purple hippos' muddy riverbank; the hippos then watch as a grinning crocodile eyeballs the child, who then escapes: ""To the jeep, and/ toward the trees!/ Somersault with chimpanzees."" After a busy day, the young adventurer huddles in a green sleeping bag within a red tent while animal noises in large white type grow menacing (""Hoot Snort Grunt... Roar!!!"") When a lion circles, then pounces, the child roars back, scaring the lion away. Only in the final pages does the author reveal (with the intrusion of two grown-up feet) that this safari has taken place in the comfort of home. Ages 2-5.